A newcomer on Moscow's restaurant scene, Gastro Pub Chelsea brings a fresh breath to the city's pub culture. 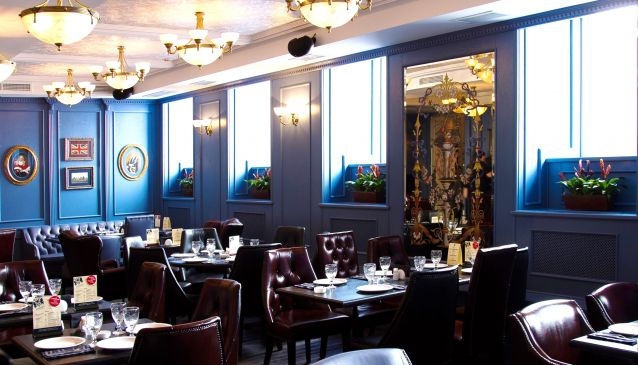 Named after London's elite Chelsea neighborhood, this exquisitely decorated gastro-pub set out to offer Muscovites a chance to immerse themselves in the fashionable Chelsea atmosphere without leaving Moscow's city center and to give expats a place to meet and feel like they're back home. Tucked away just off Moscow's bustling Tverskaya Street, Gastro Pub Chelsea provides traditional English pub hospitality while also maintaining tranquility and the coziness of an aristocratic gentlemen's club, giving guests a chance to sit down, relax and enjoy each other's company. Gastro Pub Chelsea boasts a very stylish and sleek interior: fine leather armchairs and sofas in the pub's smoking and non-smoking rooms add to the beau monde feeling, the marengo walls are neatly decorated with portraits of Churchill, Her Majesty and other well-known Brits and the bar is fully stocked with the finest spirits and, of course, Guinness on draft. From the name - Gastro Pub Chelsea - it is evidently clear that the matter of food is not treated lightly here. The menu, specially designed by chef Anton Volkov (founder of two of London's most popular steak houses), offers guests a delightful and mouth-watering choice of England's traditional pub cuisine and culinary masterpieces of the empire's former colonies, although all of them prepared in a Spanish wood oven with a unique twist. Ribs are prepared with a hearty layer of BBQ sauce with cumin and coriander and garnished with fresh celery, carrots and sweet pepper. The pork burger's texture and taste is enhanced with the addition of prawns, the chowder is very generous on the fish, the duck fillet is served with an apple jelly that hides cranberries inside, lamb in a mint sauce...the description of the menu can go on for several more paragraphs but we would not want to tempt any of our hungry readers more than necessary. In the mornings, come down to Gastro Pub Chelsea for a hearty English breakfast or a light breakfast for the ladies. This is also a great place for a weekend brunch! Whiskey lovers will be impressed by the pub's collection of over 100 sorts from different countries, though unsurprisingly Scotland's single malts predominate. A wide variety of other liquors and draft beers, as well as an extensive wine menu serve as an alternative for those who do not share an affinity for whiskey. Eating and drinking are not the only things guests can do at Gastro Pub Chelsea. With the exception of Sundays and Mondays, every night of the week has its own special theme and entertainment program. On Tuesdays the pub's cigar club is a meeting place for cigar connoisseurs, on Wednesdays the DJ spins relaxing and unimposing lounge music, on Thursdays head on down for live piano jazz, while Fridays are dedicated to live saxophone jazz performances and on Saturdays guests can experience a unique black and white party. If there's a game on, Gastro Pub Chelsea will show it on one of its several flat screens. Night or day, Gastro Pub Chelsea has something to offer for everyone so come and enjoy life English-style!